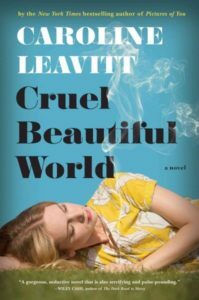 Caroline Leavitt’s latest novel, Cruel Beautiful World, is not unlike her earlier books: full of sad, lonely characters who have suffered cruel twists of fate trying to find happiness in challenging circumstances. In this most recent novel, 16 year-old Lucy has run off with her 30 year-old teacher William, a hippie who has been fired for not adhering to the traditional curriculum. It’s the 60s, and William’s talk of running away to be free and in love persuades the immature teenager to leave her sister Charlotte and her much older adoptive mother, Iris. Unsurprisingly, life in the small rural town William takes Lucy to is isolating and boring, while he goes off to work every day but forbids her from talking to anyone or contacting her family because she is underage. Cruel Beautiful World is a bit of a thriller – what will happen to Lucy? can she escape from angry, controlling William? When it doesn’t all go as planned, who will find out, and will justice be served? Interspersed with Lucy’s story are the offshoot stories of Iris, Charlotte, and Patrick, a widower whom Lucy secretly befriends during her long, lonely days. I enjoyed the explorations of these characters, and I think that is where Leavitt is at her strongest. She takes her time explaining how her characters became the people they are, and she imbues them each with dignity, empathy and just enough hope to keep the reader invested. The story of Lucy and William was much more problematic for me. William is a child predator: emotionally abusive and unconscionably selfish. I know that Leavitt intends for the reader to understand that about him – in interviews, she said she based him on a real-life controlling partner – but shockingly, she sort of lets him off the hook in the end. It’s as if she wants the reader to wonder if he were really that bad. (!) (Yes, he was.) Also, I found it unrealistic that Lucy would have kept silent for so long. She had opportunities for escape and didn’t take them. I wasn’t convinced enough of her love for (or fear of ) William that she would have stayed with him that long. She was immature and selfish herself, and I think in the end she would have just done what she wanted. So Cruel Beautiful World was a mixed bag for me. I loved the classic Leavitt touches but found the underlying plot problematic. I listened to Cruel Beautiful World on audio. Xe Sands did a masterful, restrained performance, especially during the Iris chapters. Her smooth, understated delivery was perfect for the book. I did wonder whether she was as frustrated with the main characters as I was!